SR 100 originates at the intersection of Middleboro Road (unsigned SR 62) and South Dupont Road, at the Middleboro Manor subdivision near Banning Park. The initial leg along South Dupont Road north to SR 4 (Maryland Avenue) at Richardson Park is unsigned. Dupont Road separates into a couplet with Race Street northbound at the signed beginning of SR 100 north to Eureka Street. The state route expands into a four-lane arterial from there as it elevates across the CSX Railroad into the town of Elsmere. Dupont Road narrows to a four-lane boulevard through eastern reaches of Elsmere, from SR 2 (Kirkwood Highway) and New Road north to SR 34 (Faulkand Road) at Silverbrook Cemetery and SR 48 (Lancaster Avenue). Nipping the northwest corner of Wilmington, SR 100 combines with SR 48 along Lancaster Pike west to Barley Mill Plaza, and along the SR 141 Expressway north to Montchanin Road and the community of Greenville. Montchanin Road leads the final 4.85 miles of the route along a winding course to Montchanin, Brandywine Creek State Park and Guyencourt as the Brandywine Valley Scenic Byway. Delaware 100 appeared on the 1938 Official Delaware Highway Map as part of a multi state route with Pennsylvania 100 north, from Delaware 52 (Kennett Pike) to U.S. 1 at Chadds Ford. Delaware 100 was extended south from Delaware 52 to Delaware 4 (Maryland Avenue) along Dupont Road in 1970. The SR 100 alignment along North Dupont Road between SR 48 (Lancaster Avenue) and SR 52 (Kennett Pike), both along the Wilmington city line by Westmoreland, and through the Westover Hills community, was dropped from the state route system in 1989. SR 100 was realigned to move truck traffic from that stretch onto overlaps with SR 48 for 0.92 miles and SR 141 for 1.45 miles. North Dupont Road at Delaware 52 (Kennett Pike), where Delaware 100 previously turned northward toward Greenville. Photo taken 12/20/17. Dupont Road (unsigned SR 100) stems north from Middleboro Road (SR 62) through the Middleboro Manor community. Photo taken 12/23/17. Dupont Road north at Valley Road and the Ashley neighborhood. The unmarked segment of SR 100 extends 0.54 miles north to SR 4 (Maryland Avenue) at Richardson Park. Photo taken 12/23/17. South Dupont Road (SR 100) ties into SR 4 (Maryland Avenue) opposite SR 100 southbound along North Dupont Road. SR 100 north branches north from Maryland Avenue a tenth of a mile east at Race Street. Photo taken 12/23/17. The initial stretch of Delaware 100 north follows Race Street from Delaware 4 (Maryland Avenue) to Atlantic Avenue. Photo taken 12/30/16. Howard Street leads south back into Richardson Park as Delaware 100 (South Dupont Road) curves northwest ahead of a viaduct across the CSX Railroad and Baltimore Avenue. Old Dupont Road spurs north from Howard Street to dead end at the former railroad crossing nearby. Photo taken 12/30/16. Delaware 100 (Dupont Road) descends toward Delaware 2 (Kirkwood Highway) in the town of Elsmere. Kirkwood Highway constitutes a four-lane arterial west to Prices Corner and Newark and east to Canby Park in Wilmington. Photo taken 12/28/12. Delaware 2 ascends over a viaduct above the CSX and Delaware Valley Railroads to Union Street by the Canby Park Estates community. The state route ends at Delaware 52 (Pennsylvania Avenue) beyond the Little Italy neighborhood of Wilmington. Photo taken 12/28/12. Delaware 100 northbound reassurance shield posted between Delaware 2 (Kirkwood Highway) and New Road. Photo taken 12/20/16. New Road parallels Delaware 2 west to Sanders Road and the Elsmere business district and east to Colonial Avenue by the CSX Railroad. The two lane roadway represents the original alignment of Delaware 2 before the 1949 railroad overpass was constructed. Photo taken 12/20/16. Dupont Road spans the Delaware Valley Railroad to the immediate north of New Road on a 1959-built bridge. Photo taken 12/20/16. Cleveland Avenue branches northeast from North Dupont Road through the Colonial Park and Colonial Heights street grid to Delaware 48 (Lancaster Avenue) and the Greenhill neighborhood in Wilmington. A reassurance marker for Delaware 100 follows. Photo taken 12/20/16. 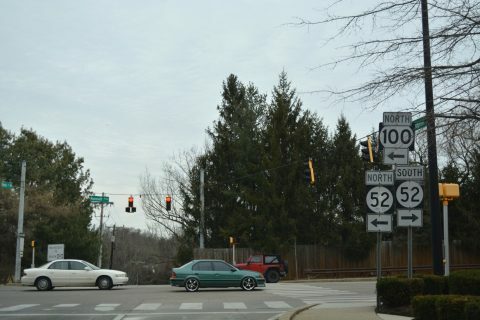 Motorists along SR 100 (Dupont Road) leave the town of Elsmere through Lancaster Village and next meet the east end of SR 34 (Faulkland Road). SR 34 follows all of Faulkland Road west to Brandywine Springs Park and Duncan Road to the north of Prices Corner. Photo taken 12/20/16. Dupont Road curves northeast between Silverbrook Memorial Park and the Colonial Park community to SR 48 (Lancaster Avenue) at the northwestern corner of Wilmington. Photo taken 12/20/16. Junction shield for SR 48 posted on SR 100 north at Watson Avenue. SR 48 (Lancaster Avenue) represents the main arterial route joining Wilmington with Hockessin. Photo taken 12/20/16. SR 100 joins SR 48 (Lancaster Pike) between South Dupont Road and SR 141 (Centre Road). This assembly was taken down by 2016. Photo taken 03/20/04. Delaware 48 east makes a gradual descent toward the Christina River and LOMA through the Bayard Square, Hilltop and Hedgeville neighborhoods of Wilmington. The state route meets Interstate 95, 1.5 miles to the east at Jackson and Adams Streets. Photo taken 12/20/16. SR 48 west & 100 north nip the northwestern corner of Wilmington adjacent to the Cab Calloway School of the Arts (the old Wilmington High School), located between the north and south segments of Dupont Road. Photo taken 12/20/17. SR 100 separates from SR 48 (Lancaster Pike) and combines with SR 141 (Centre Road) 1.4 miles northeast to Greenville. SR 48 continues west toward Hockessin. Photo taken 12/20/17. SR 141 (Centre Road) encircles Wilmington and Elsmere southwest to Newport and east across the Tyler McConnell Bridge to Fairfax. The state route crosses SR 48 as a controlled access arterial, with the wide right of way here originally reserved for a grade separation with Lancaster Pike. Photo taken 12/20/17. Montchanin Road branches north from Delaware 52 (Kennett Pike) to become a part of Delaware 100 north of forthcoming Delaware 141 (Barley Mill Road). This segment was dropped from the state route in 1989. Photo taken 12/22/16. Delaware 100 north splits with Delaware 141 east as its short expressway segment by Greenville ends. Delaware 141 reduces to two lanes east of Montchanin Road across the Tyler McConnell Bridge. Photo taken 12/22/16. Delaware 100 confirming marker posted north of Delaware 141 (Barley Mill Road). Leading north to Pennsylvania, Montchanin Road is a part of the Brandywine Valley Scenic Byway. Photo taken 12/20/16. 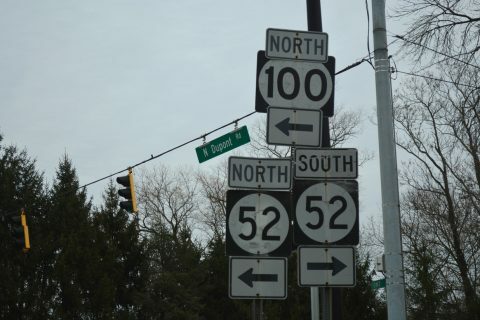 Buck Road stems east from Delaware 52 (Kennett Pike) and the community of Greenville to a signalized intersection with Delaware 100 (Montchanin Road). Buck Road spurs east to the upscale Centennial neighborhood and the Hagley Library. Photo taken 12/22/16. Rockland Road branches northeast from Delaware 100 at Montchanin. The scenic road winds east to cross Brandywine Creek at Rockland, before turning southward to Blue Ball. Photo taken 12/22/16. Kirk Road links the south end of Delaware 82 (Campbell Road) and Delaware 52 (Kennett Pike) with Delaware 100 at Montchanin. Photo taken 12/22/16. SR 100 runs along the east side of Wilmington Country Club golf course and the Winterthur estate between Kirk Road and SR 92 (Thompson Bridge Road). Photo taken 12/21/17. Approaching the west end of SR 92 (Thompson Bridge Road) and Adams Dam Road south at Brandywine Creek State Park. Adams Dam Road connects both state routes with the main park access area and Rockland to the southeast. Photo taken 12/22/16. SR 100 (Montchanin Road) meanders another 2.7 miles north from SR 92 and Adam Dam Road to the Pennsylvania state line. This follow up shield assembly is no longer posted. Photo taken 12/18/04. SR 92 commences a 8.8-mile route to Claymont along a scenic stretch through Brandywine Creek State Park. The state route follows a well traveled arterial route (Naamans Road) from U.S. 202 east through Brandywine Hundred. Photo taken 12/22/16. SR 100 leaves Brandwine Creek State Park ahead of Adams Dam Road north to Biderman Golf Course and Center Meeting Road. Photo taken 12/18/17. Continuing north from Adams Dam Road, the succeeding reassurance marker for Delaware 100 appears. Photo taken 12/18/17. The Delaware Valley Railroad spans Delaware 100 (Montchanin Road) across a steel girder bridge dating to 1945. Photo taken 12/18/17. Forthcoming Guyencourt Road loops east then south from Delaware 100 (Montchanin Road) back to Delaware 92 (Thompson Bridge Road). Photo taken 12/18/17. Montchanin Road intersects Smith Bridge Road at a four-way stop. Smith Bridge Road angles northeast from Center Meeting Road to Smiths Bridge, a covered bridge crossing Brandywine Creek. Photo taken 12/18/17. Delaware 100 (Montchanin Road) weaves through a series of S-curves between Smith Bridge Road and Twaddell Mill Road. Photo taken 12/18/17. SR 100 ends just north of Twaddell Mill Road as Montchanin Road transitions to Creek Road into Delaware County, Pennsylvania. There are no signs posted for the state boundary. PA 100 formerly continued the multi state route north 2.8 miles to U.S. 1 at Chadds Ford. Photo taken 12/18/17. Creek Road enters New Castle County, Delaware and becomes Montchanin Road and SR 100. Photo taken 12/18/17. The first shield for Delaware 100 south stands at the intersection with Twaddell Mill Road west to Centerville. Photo taken 12/18/17. Montchanin Road emerges from a winding stretch to intersect Smith Bridge Road at a four-way stop. Photo taken 12/18/17. Delaware 100 (Montchanin Road) advances south from Smith Bridge Road along side a tributary of Wilson Run to Guyencourt. Photo taken 12/18/17. The Delaware Valley Railroad spans SR 100 (Montchanin Road) south of Guyencourt Road. SR 100 crosses the same line again just outside Wilmington. Photo taken 12/18/17. SR 100 intersects the west end of SR 92 (Thompsons Bridge Road) and Adams Dam Road at Brandywine Creek State Park. SR 92 weaves northeast along a scenic route to Beaver Valley Road just off the commercial corridor along U.S. 202 (Concord Pike). Photo taken 12/18/17. SR 100 (Montchanin Road) advances south from SR 92 (Thompson Station Road) toward Montchanin, Greenville and Wilmington. Photo taken 12/22/16. Kirk Road links SR 100 and Montchanin with SR 82 (Campbell Road) north to Ashland and Yorklyn. The road also comprises a one way connector east to Rockland Road. Photo taken 12/22/12. Eagle Flatback signals previously operated at SR 100 (Montchanin Road) and Kirk Road. Photo taken 08/01/04. SR 100 parts ways with Montchanin Road and its former alignment south to Wilmington and joins SR 141 (Barley Mill Road) south. The two routes run concurrently for 1.45 miles to SR 48 (Lancaster Pike). Photo taken 12/20/16. SR 100 (Montchanin Road) and 141 (Barley Mill Road) intersect just east of a parclo interchange joining the SR 141 expressway with SR 52 (Kennett Pike). Montchanin Road provides the movement from SR 141 south to SR 52 east into Wilmington in lieu of a direct ramp. Photo taken 12/20/16. Delaware 141 constitutes a belt route to the north and west of Wilmington. The state route ends at U.S. 202 (Concord Pike) and Delaware 261 (Foulk Road0 near Fairfax to the east. Photo taken 12/20/16. Confirming markers for SR 48 east & 100 south at the start of their 0.92 mile overlap. This set of shields is no longer posted as of 2016. Photo taken 04/26/04. Lancaster Pike leads both SR 48 east & 100 south one mile from SR 141 (Centre Road) to the city of Wilmington. Photo taken 12/20/16. Nearing the Wilmington city line and the southbound split of Delaware 100 from Delaware 48 (Lancaster Pike) east. Photo taken 12/20/16. Delaware 48 follows Lancaster Avenue east through the Greenhill neighborhood of Wilmington toward Downtown while Delaware 100 joins South Dupont Road to Elsmere. Photo taken 12/20/16. SR 100 (Dupont Road) concludes 1.64 miles to the south at SR 4 (Maryland Avenue) in Richardson Park. Photo taken 12/20/16. Confirming shield for SR 100 south along South Dupont Road between Silverbrook Cemetery and the Colonial Park community. South Dupont Road carries four lanes to Richardson Park. Photo taken 12/20/16. Delaware 34 commences a 3.30-mile route from Delaware 100 south at Lancaster Village. Generally serving local or commuter traffic, Faulkland Road leads the state route west to Delledonne Corporate Center, residential areas north of Prices Corner, and Brandywine Springs Park to Delaware 41 (Newport Gap Pike). Photo taken 12/20/16. South Dupont Road veers southward from the traffic light at Faulkland Road through the Lancaster Village street grid. Photo taken 12/20/16. Two blocks south of Faulkland Road, drivers on SR 100 (South Dupont Road) enter the town of Elsmere. Photo taken 12/20/16. Cleveland Avenue angles southwest from SR 48 (Lancaster Avenue) and Wilmington to tie into North Dupont Road ahead of this reassurance marker. Photo taken 12/20/16. North Dupont Road lowers from a bridge across the Delaware Valley Railroad to back to back signals with New Road and Delaware 2 (Kirkwood Highway). Photo taken 12/20/16. New Road spurs east to an industrial area beside the CSX Railroad and west to the Elsmere business district at Sanders Road and Delaware 2 (Kirkwood Highway). Photo taken 12/20/16. Delaware 2 (Kirkwood Highway) travels across the heart of Elsmere as a busy arterial route west to Prices Corner. The state route elevates onto a viaduct above the adjacent CSX and Delaware Valley Railroads to Union Street into Wilmington. Photo taken 12/20/16. Delaware 100 (South Dupont Road) rises to span Baltimore Avenue, the CSX Railroad line, and B and O Lane on a 1980-built viaduct. The reassurance marker posted south of Delaware 2 was replaced with a speed limit 35 sign by 2012. Photo taken 12/20/16. The four lane bridge replaced a two-lane alignment and at-grade railroad crossing to the east. Delaware 100 touches back down beyond the Elsmere town line at Richardson Park. Photo taken 12/20/16. Old Dupont Road converges with Delaware 100 North Dupont Road) across from Howard Avenue, a residential street south through Richardson Park. Photo taken 12/20/16. Delaware 100 curves east and separates into a one-way couplet beyond Eureka Street. Northbound follows Race Street while southbound concludes along North Dupont Road. Photo taken 12/20/16. A pair of end shields accompany North Dupont Road as Delaware 100 intersects Delaware 4 (Maryland Avenue) in the Richardson Park business district. Photo taken 12/20/16. Delaware 4 (Maryland Avenue) constitutes a four-lane arterial east to Browntown in Wilmington and west through Richardson Park to Newport. Photo taken 12/20/16. An unsigned branch of SR 100 extends south from SR 4 along South Dupont Road to Middleboro Road (unsigned SR 62) near Banning Park. Photo taken 12/20/16. North Dupont Road leads away from SR 48 & 100 (Lancaster Avenue) and straddles the Wilmington city line to the Westmoreland and West Haven neighborhoods. A truck restriction along this former stretch of SR 100 prohibits vehicles exceeding 5,000 pounds. Photo taken 12/20/16. This shield assembly still references the former turn of Delaware 100 south from North Dupont Road to Delaware 48 (Lancaster Pike) east. Photo taken 12/20/16. Kirk Road east at SR 100 (Montchanin Road) and Montchanin. Photos taken 12/21/17. "Route 100 loses its way through West Chester." The Philadelphia Inquirer, October 9, 2003.